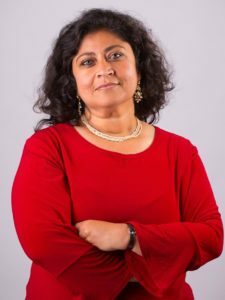 Nilanjana Dasgupta spoke to Franklin & Marshall College on Thursday, September 20th about the vital role mentors have on students entering a field, specifically STEM: a field that is dominated by white, cisgender men. Her guiding question was to examine the effect of STEM mentors on students and what causes the differences between the ratios between men and women who succeed in STEM fields. And instantly the audience is forced to grapple with the intersectionalities of sociology, politics, and science. Her data show that in high school and middle school, boys and girls performed the same on standardized tests, but in college, women choose non-STEM majors. Why does this happen and why does it matter that women are not choosing STEM? It turns out that these are some of the fastest growing and highest-paying jobs, so breaking into these fields also helps women and minorities overcome some sociological and economic barriers. The choices that students make in what to study are largely a function of who they see already excelling in that field and are not necessarily as “free” as they might be thought to be. Dasgupta continued to say that jobs in STEM act as “social vaccines” that provide immunity against social homogeneity in the lab. The leaders that students see in their fields of interest impact their motivations to get there too and to be actively engaged. This is impactful for students who are of racial and gender minorities, which Dasgupta supported with her own data figures. The dream suddenly “seems plausible because they can follow the storyline… and there is connection, self-identification.” The success of professionals who the students can identify with undercuts the stigma around that demographic’s involvement because the evidence of prosperity is explicit. Implicit liking of a subject depends on whether the female students have a male or female instructor. This was statistically significant for women, but results were unchanged for men. Because timing is so crucial for encouraging diversity in STEM, Dasgupta and her research team also wanted to find out if the gender of a 1st or 2nd year’s peer mentor matters in terms of self-identification and inspiration to continue in a STEM field. Through “explicit surveys”, Dasgupta found out that if variables such as mentor performance level and availability for mentee were held constant, the variable that fluctuated was how close to their mentor a student felt, which dramatically affected women’s confidence and feeling of belonging in STEM. This feeling of belonging is critical for students to stay on an academic path. For students without mentors, their confidence dropped sharply after a year, and so did their desire to pursue graduate school for engineering. One year later after the mentorship had ended, these trends either remained constant or became accentuated and the women’s interest in engineering remained constant. Thus, peers also have the social vaccine affect. So, how do we achieve gender diversity in STEM? The first thing is to find a professional with whom a student can identify. Secondly, it helps to have a peer mentor to be “open about experiences with” and to normalize experiences that might seem stressful for incoming students. The third aspect is to integrate different demographic groups in group work. If the students are clustered with a few others with whom they can identify, it will give them confidence to speak up. Oftentimes in science classes it isn’t that male students are always right, it’s that they speak with confidence because they were socialized to do so. Confidence for marked demographics in class depends on whether students feel as though they belong.